When Stalin ordered the formation of partisan groups to operate behind German lines following their invasion of the Soviet Union and its occupied territories in 1941 Hitler was delighted because, as he pointed out, it gave him the ideal excuse to eradicate everyone who opposed him. Of course it went much further than that, for the Germans planned and implemented a programme to enslave Slavs and exterminate Bolsheviks, Jews and others. As a result the considerable initial good will felt by some of the people in the occupied areas rapidly evaporated and the partisan movement grew to be a very real thorn in the side of the German forces as they increasingly struggled to cope with the resurgent Red Army. Everyone knows how much of a part the Russian winter played in the ultimate defeat of the Germans, but while the Germans suffered in the cold and the wet so did many of the partisans, who often lacked adequate supplies. Yet they too operated in winter of course, and so a set of such fighters dressed for winter is highly appropriate, and that is what we have here. Faced with the challenges of surviving through the winter the partisans used whatever resources were available, so a typical band would be wearing a mixture of civilian and military warm clothing, as are the figures in this set. Some wear the quilted trousers and/or tunic, while others have civilian or army coats of various kinds. All are lucky enough to have boots, with some looking to be the Valenki felt boots, and of course there are a good number of warm fur caps, although one man is making do with the ubiquitous peaked cap most peasant men wore in warmer conditions. 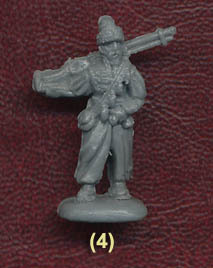 Kit of course is sparse and pretty random, but again some military elements can be seen so that is fine. Weaponry is the usual mix of Soviet and German, with both rifles and submachine guns in use. One man is firing a DP28 from the hip, a crawling figure is holding a knife as if approaching a sentry and another is holding a Molotov cocktail (although no Party member would have called it that of course as the name is an insult to the Soviet foreign minister and a joke on Soviet stupidity). The last figure in the second row holds what looks like a sawn off rifle, sometimes termed an 'obrez', which was widely made and used as they were much easier to conceal than a full rifle. The general level of sculpting is quite poor, and below what Strelets generally deliver. All the usual features are here of course, with the weapons in particular being much too thick and clunky. There is little requirement for fine detail on the clothing, which is just as well, but a few of the poses are extremely flat. The man kneeling firing is much too flat and would not be able to hold such a position unsupported, while the woman with the medical bag in the third row is also poorly done. The prone firing man has no face as he is done in one piece, and on our examples there was a surprising amount of flash, although this did vary between sprues. The poses are not inspiring but acceptable, and the accuracy is fine, so it is really how appealing you find these figures which will probably decide whether this set is a purchase or not. While we didn't care for the sculpting the set depicts its subject quite well and if you are looking for some partisans to attack the Axis during the bitter winter months then this will certainly do.